SCP-1580, covered in instances of SCP-1580-1. Special Containment Procedures: SCP-1580 is currently held in the Site-30 terrarium, within a 7 by 7 meter lot. Instances of SCP-1580-1 are to be constantly monitored for alterations in behavior or vocalizations. Attempted communication with sapient instances of SCP-1580 is currently prohibited. 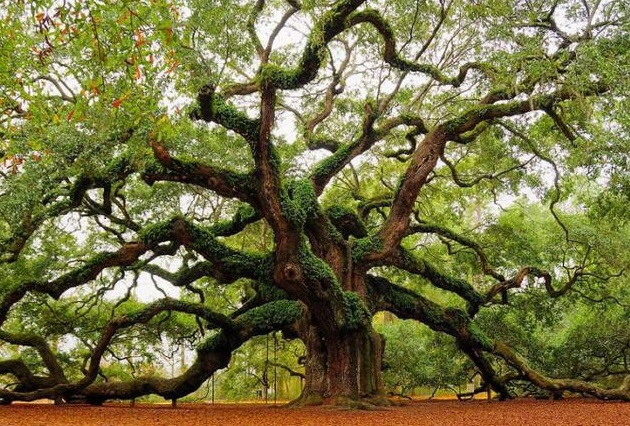 Description: SCP-1580 is a Quercus virginiana specimen, also known as the Southern Live Oak. It currently has a limb spread of 19 meters and is 22 meters in height (10/3/2010). SCP-1580's age is currently estimated to be 65 years, and it shows no remarkable qualities regarding its physical appearance or composition. SCP-1580 sheds its leaves at a heightened pace, ranging from 70 to 180 in one minute. SCP-1580's main anomalous property is the autonomous nature of its leaves, designated instances of SCP-1580-1. Instances of SCP-1580-1 display no anomalous properties until they are detached from SCP-1580; this may be caused through either manual removal by outside forces or SCP-1580's anomalous property. Upon making contact with a solid surface, an instance of SCP-1580-1 will sprout four limbs, extending from its veins. SCP-1580-1's veins grow about 2 cm from their original positions, and are used for both bipedal and quadrupedal mobility. After developing these limbs, SCP-1580-1 will attempt to travel to where it originally grew on SCP-1580. It will use all four limbs to climb SCP-1580's trunk; once it reaches its original location, it will seamlessly reattach its stipule to the branch by physical contact. Instances of SCP-1580-1 appear to display sentience, as they wait for other instances to reattach themselves before continuing to climb to their branch. Preventing an instance from reaching its branch will cause its limbs to recede back into itself, and decomposition will begin as expected. SCP-1580 will begin to naturally grow another instance of SCP-1580-1 if any are destroyed or otherwise removed from its proximity. Whispering of 15 to 18 db can be heard from all instances. Attempts to record single instances of SCP-1580-1 will cause the instance to cease speech, and no coherent speaking can be singled out in recordings of all instances at once. Further study on the possibility of sapience is underway. Addendum 1580-A: All instances of SCP-1580-1 halted on ██/█/████. Recordings of the event, under later inspection, revealed one instance of SCP-1580-1 to be speaking at 38 db. No evidence of the event described by the instance has been found, and evaluation of the involvement of [REDACTED] in society is under consideration. Today, one whole tale has been forgotten. Not just simply left in the archives of an old, but left in their withered corpse. An occasion that rarely occurs. How many years has it been since the first one? Time went from crawling to flying, though I do not know how. Look at me now. The only reason I'm still here is my immaturity. Making myself bustle and hustle about. I'm no more in worth than the villages of today. This is not how I should be. Sickening. My tale has already been long forgotten. I cannot remember it myself. Ah, how I wish for days past. But today, I am trapped with the very men and women who vanquish tales. Those that are left alive today are nothing but warped figures of what used to be. Never mind my rambling. I will continue my shrieking. Remembrance is nice, even if it's made from those you despise. Don't want to die, in tears and grime.